Ligation of either CD28 or inducible costimulatory protein (ICOS) produces a second signal required for optimal T cell activation and proliferation. One prominent difference between ICOS- and CD28-costimulated T cells is the quantity of IL-2 produced. To understand why CD28 but not ICOS elicits major increases in IL-2 expression, we compared the abilities of these molecules to activate the signal transduction cascades implicated in the regulation of IL-2. Major differences were found in the regulation of phosphatidylinositol 3-kinase activity (PI3K) and c-jun N-terminal kinase. ICOS costimulation led to greatly augmented levels of PI3K activity compared with CD28 costimulation, whereas only CD28 costimulation activated c-jun N-terminal kinase. To examine how these differences in signal transduction affected IL-2 production, we transduced primary human CD4 T cells with a lentiviral vector that expressed the murine CD28 extracellular domain with a variety of human CD28 and ICOS cytoplasmic domain swap constructs. These domains were able to operate as discrete signaling units, suggesting that they can function independently. Our results show that even though the ICOS Src homology (SH) 2 binding domain strongly activated PI3K, it was unable to substitute for the CD28 SH2 binding domain to induce high levels of IL-2 and Bcl-xL. Moreover, the CD28 SH2 binding domain alone was sufficient to mediate optimal levels of Bcl-xL induction, whereas the entire CD28 cytoplasmic tail was required for high levels of IL-2 expression. Thus, differences within their respective SH2 binding domains explain, at least in part, the distinct regulation of IL-2 and Bcl-xL expression following ICOS- or CD28-mediated costimulation. Proper activation of resting T cells requires the coordinated delivery of two distinct signals. The first signal is transduced by the TCR/CD3 complex, on the recognition of processed antigenic peptides in combination with MHC molecules on APCs. A second signal, termed costimulation, determines the functional outcome of T cell interactions with APCs. CD28 and inducible costimulatory protein (ICOS)3 are two members of the CD28 family that function as costimulatory molecules, and each promotes T cell proliferation and cytokine secretion. ICOS-deficient mice have defects in class switching and germinal center formation (similar to CD28-deficient mice; Ref. 1), suggesting that CD28 and ICOS play nonredundant roles in developing humoral immunity (2, 3, 4). The precise roles ICOS and CD28 play in the immune system are still unclear, but comparing the outcome of ICOS and CD28 blockade in several disease models has revealed clues. Blockade of either ICOS or CD28 interfered with both IFN-γ production and generation of protective immunity in lymphocytic choriomeningitis virus (5) and Toxoplasma gondii (6) in vivo infection models, suggesting a nonredundant relationship between ICOS and CD28 costimulation. Moreover, examination of when the costimulatory blockade is administered has revealed that CD28 is crucial for priming while ICOS is more important to maintaining the T cell response (7, 8). Additionally, CD28 is constitutively expressed at a high level on resting T cells, whereas ICOS is modestly expressed on resting T cells and induced to high levels upon CD28-mediated T cell activation (9). Expression profiling comparing ICOS- and CD28-costimulated T cells revealed that both costimulatory molecules show similarities in both the number and magnitude of transcripts altered, although, in general, CD28 costimulation regulated transcripts more intensely than ICOS. Curiously, CD28 costimulation was able to regulate a small number of genes (IL-2, IL-9, ICOS, myelin and lymphocyte protein NM_002371, and myosin 1F X98411) >10-fold more than ICOS costimulation, suggesting that these genes are regulated in a fundamentally different way (10). Analysis of the cytoplasmic domains of CD28 and ICOS suggests that functional distinctions may arise from their relative ability to propagate intracellular signals. Neither molecule encodes any recognized enzymatic activity, thus their signal transduction capacity is dependent upon recruitment of cytoplasmic molecules. In this respect ICOS appears at a disadvantage to CD28. For example, the intracellular domain of CD28 includes four tyrosine residues, potentially mediating protein-protein interactions, compared with two in ICOS. The Src homology (SH) 2 binding domains of CD28 (YMNM) and ICOS (YMFM) can both bind p85, the regulatory subunit of phosphatidylinositol 3-kinase (PI3K) (8, 11), however CD28 also binds the adaptor molecules Grb2 (12) and Grb2-related adaptor downstream of Shc (13). Furthermore, CD28 encodes two SH3 binding motifs (PXXP), which are absent in ICOS. These differences may impair the ability of ICOS to couple to intracellular signaling pathways such as the mitogen-activated protein (MAP) kinases (14). The unique ability of CD28 costimulation to induce T cells to make massive amounts of IL-2 has been the subject of intense research, centered on the signal transduction cascades activated by this molecule. However, the exact relevance of these pathways to IL-2 regulation has been controversial due partly to the use of different cellular models. For example, activation of the PI3K target protein kinase B/Akt has recently been described as sufficient to costimulate IL-2 expression (15). Indeed, in human primary T lymphocytes pharmacological inhibition of PI3K abrogates IL-2 expression (16, 17). However, in Jurkat (18, 19, 20) and murine T cells (21), PI3K inhibitors do not block IL-2 production. Furthermore, murine T cells expressing mutant CD28 cytoplasmic tails unable to bind PI3K have been reported to express normal levels of IL-2 (22). Additionally, the role of c-jun N-terminal kinase (JNK) in IL-2 regulation has also yet to be fully resolved. In Jurkat and human primary T cells, numerous observations implicate JNK in IL-2 regulation. CD28 engagement synergizes with CD3 signals in both activation of JNK and promotion of IL-2 expression (23, 24). Truncation mutation of CD28 resulting in loss of JNK activity also abolishes IL-2 production (24), and cells showing enhanced JNK activation express elevated levels of IL-2 (25). However, in murine cells JNK activation can occur in the absence of CD28-mediated signals, and the absence of JNK isoforms does not impair IL-2 expression (26, 27). In addition to mediating the up-regulation of cytokines, CD28 costimulation augments the expression of Bcl-xL (28), a key cell survival molecule that prevents the induction of apoptosis. Two lines of evidence suggest that IL-2 and Bcl-xL are distinctly regulated by CD28 costimulation: 1) CTLA-4 engagement blocks CD28-mediated up-regulation of IL-2 but not Bcl-xL (29) and 2) mutations that disrupt the murine CD28 SH2 binding domain block the ability of CD28 to up-regulate Bcl-xL but not IL-2 (22, 30). The signals that differentially control IL-2 and Bcl-xL induction by CD28 costimulation have not been determined. In this report we have examined the regulation of key signaling pathways by CD28 and ICOS in human T lymphocytes. Further, we have established a model of T cell costimulation by expressing a chimeric form of CD28 in human primary CD4 T cells. To determine which regions of CD28 generate signals critical to IL-2 production, we have exploited the close structural relationship of CD28 and ICOS, and the modular nature of signaling motifs, to create domain-swap chimeras which blend the signaling characteristics of the two molecules. This approach allows a closer definition of the contribution of signaling pathways to the regulation of IL-2 in human T lymphocytes. Peripheral blood lymphocytes were isolated by Percoll (Pharmacia Biotech, Uppsala, Sweden) gradient centrifugation from leukopacks following apheresis and elutriation. CD4+ T cells were purified by negative selection using magnetic beads (Dynal Biotech, Lake Success, NY) as previously described (31) and were routinely >98% CD3+, >98% CD28+, and <3% CD8+ as determined by flow cytometry. Cells were stimulated at 37°C by mixing with beads at a ratio of 1:3 (cells to beads). Anti-CD3 (OKT3) (32), anti-human (h) CD28 (9.3; Ref. 33), anti-murine (m) CD28 (37.51; BD Biosciences, San Diego, CA), anti-ICOS (JMAb-52; Ref. 31), and anti-MHC class I (MHC-I) (W6/32) (American Type Culture Collection, Manassas, VA) were covalently attached to polyurethane coated tosyl-activated Dynal beads (Dynal Biotech) according to the manufacturer’s instructions. The murine CD28 extracellular and transmembrane domain was amplified from a mCD28 encoding plasmid (generously provided by Dr. K. Lee, University of Miami, Miami, FL) by PCR. The cytoplasmic regions of CD28 and ICOS were subdivided into a 5′ portion, defined as the region from the transmembrane domain up to and including the YXXM motif (163R to 176M for CD28, and 164L to 183M for ICOS), with the remaining COOH tail forming the 3′ portion. Oligonucleotides encoding the 5′ and 3′ portions of the ICOS and CD28 cytoplasmic were annealed and blunt-ligated together so that no extra sequences were introduced. These fragments were placed into the pCLPS lentiviral expression vector. pCLPS is a derivative of the third generation lentiviral transfer vector pRRL-SIN-CMV-eGFP-WPRE (34, 35) in which the central polypurine tract of HIV-1 (NL4-3) (36, 37) was inserted immediately upstream of the CMV promoter. All constructs were confirmed by DNA sequencing. Lentiviral vectors were produced after transfection of 293T human embryonic kidney cells cultured in RPMI 1640 (BioWhittaker, Rockville, MD), 10% FCS, 2 mM glutamine, and 100 IU/ml penicillin, 100 μg/ml streptomycin. Cells were seeded at 5 × 106 per T 150 tissue culture flask 24 h before transfection. All plasmid DNA was double-purified using a CsCl gradient. Cells were transfected with 7 μg of pMDG.1 (VSV-G envelope), 18 μg of pRSV.rev (HIV-1 Rev encoding plasmid), 18 μg of pMDLg/p.RRE (packaging plasmid), and 15 μg of pCLS transfer plasmid using Fugene 6 (Roche Molecular Biochemicals, Indianapolis, IN). Media was changed 6 h after transfection and the viral supernatant was harvested at 24 and 48 h posttransfection (38). Viral particles were concentrated 10-fold by ultracentrifugation for 3 h at 28,000 rpm with a Beckman SW28 rotor (Beckman Coulter, Fullerton, CA). 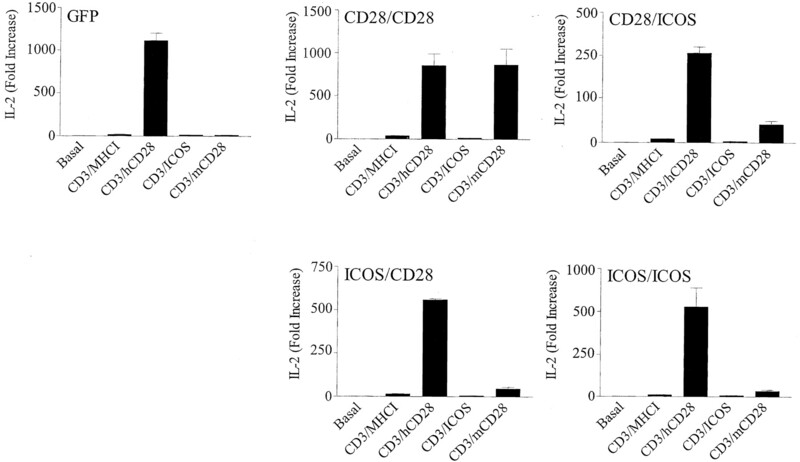 CD4 T cells were stimulated for 24 h with CD3/hCD28-coated immunobeads before infection. Three hundred to 500 microliters (∼5 × 107–5 × 108 IFU) of lentiviruses were incubated with the activated CD4 T cells on retronectin-coated 6-well plates at 37°C (Takara Shuzo, Otsu, Japan) (39) and centrifuged at 1,200 × g for 2 h (40). The following day the medium was exchanged and the cells were expanded until they returned to near resting cell volume as measured by a Coulter Counter Multisizer II (Coulter, Hialeah, FL). Cells were loaded with Indo-1 acetoxy-methyl ester (Molecular Probes, Eugene, OR) and incubated with Abs (10 μg/ml) for half an hour at 30°C. 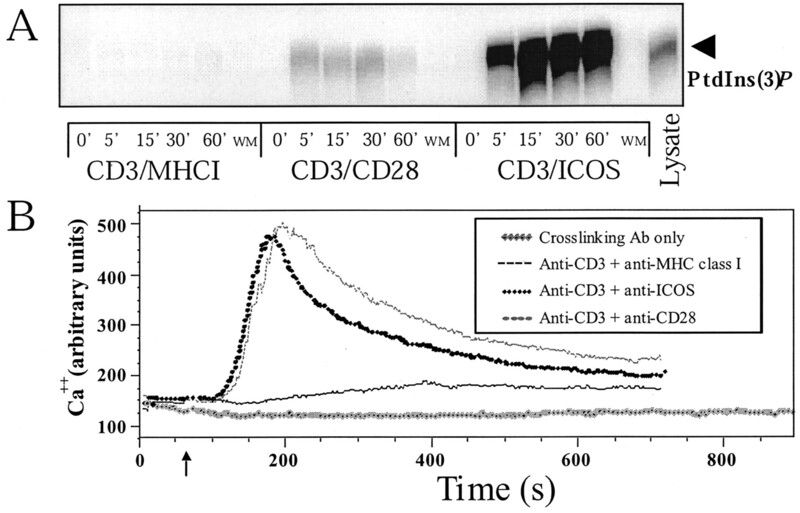 Cells were warmed to 37°C, and stimulated by addition of cross-linking Ab (anti-mouse IgG). Changes in [Ca2+]i were determined by flow cytometry. Cells were lysed in 1% Nonidet P-40 lysis buffer, as described previously (41). Lysates were resolved by SDS-PAGE and transferred to nitrocellulose. Blots were probed with appropriate phosphospecific primary Abs and proteins were visualized with ECL+ (Amersham, Piscataway, NJ). Where appropriate, blots were stripped and reprobed with Abs against the whole molecules to demonstrate equal loading of proteins. All primary Ab were obtained from (Cell Signaling Technology, Beverly, MA) and the anti-rabbit IgG-HRP secondary Ab was obtained from Calbiochem (San Diego, CA). The protein kinase activity of JNK was determined in immune complex kinase assays with 2 μg of c-jun-GST glutathione beads (Calbiochem) as the substrate. Kinase reactions were initiated by the addition of 30 μl of kinase buffer (20 mM HEPES, pH 7.7, 2 mM DTT, 20 mM β-glycerophosphate, 20 mM MgCl2, 100 μM sodium orthovanadate, 100 μM ATP, 3 μCi [γ-32P]ATP/reaction). Reactions were terminated after 15 min at 30°C by the addition of 1 ml of lysis buffer. Proteins were resolved by SDS-PAGE, gels were dried down, and labeled protein was visualized by PhosphorImager (Molecular Dynamics, Sunnyvale, CA). Samples were washed sequentially in 1% Nonidet P-40 lysis buffer, PBS, LiCl (0.5 M LiCl, 100 mM Tris, pH 7.4), water, and finally kinase buffer (5 mM MgCl2, 0.25 mM EDTA, 20 mM HEPES, pH 7.4). The washed samples were resuspended in 30 μl of kinase buffer before addition of 50 μl of a mixture of 0.1 mg/ml PtdIns with 0.1 mg/ml PtdSer. Reactions were initiated by the addition of 20 μCi [γ-32P]ATP and 100 μM ATP, and terminated after 15 min at 30°C by the addition of 100 μl of 1 M HCl. Lipid products were extracted by partitioning in chloroform and resolved by TLC using propan-1-ol:acetic acid (65%:35% v/v) as the solvent. Phosphorylated lipids were visualized by PhosphorImager (Molecular Dynamics). RNA was purified and reverse-transcribed as described previously (31). Primers and probes to detect IL-2, Bcl-xL, and 28S were designed using Primer Express software (Applied Biosystems, Foster City, CA). Real-time PCR amplification and product detection was performed using the ABI Prism 7700 (Applied Biosystems) as recommended by the manufacturer. A duplicate cDNA reaction was set up in which reverse transcriptase was left out and was used to detect the presence of genomic DNA. Results were normalized to 28S RNA levels and relative expression was determined using the ΔΔ cycle threshold method as recommended by the manufacturer. To understand why CD28 but not ICOS synergizes with CD3 signals to induce IL-2 expression, we examined the ability of ICOS to activate key signaling pathways implicated in the regulation of IL-2. As described earlier, the role of PI3K in IL-2 expression is controversial. p85 binding to the ICOS tail has been described, and this binding was shown to produce less lipid kinase activity than CD28 in Jurkat T cells (8). To compare the ability of ICOS and CD28 costimulation to activate PI3K in primary cells, fresh CD4 T cells were initially stimulated with PHA and IL-2 to induce ICOS expression (31) so that surface expression of CD28 and ICOS were comparable. 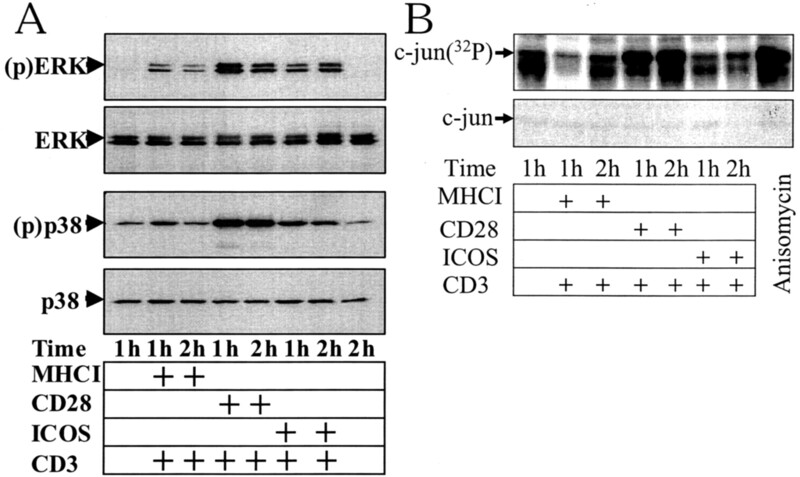 CD3/MHC-I-, CD3/28-, and CD3/ICOS-coated beads were then used to stimulate the PHA blasts and PI3K activity was measured (Fig. 1⇓A). Negligible lipid kinase activity was detected in immunoprecipitates derived using beads coated with anti-CD3 in combination with anti-MHC-I, indicating that sustained activation of PI3K requires costimulatory signals. CD28 induced high and sustained levels of PI3K activity, consistent with previous reports (8, 17). In contrast, ICOS induced a striking activation of PI3K activity, such that the CD28 signal paled in comparison. The CD3/ICOS-associated lipid kinase activity was fully induced within 15 min of cell stimulation and sustained for at least 1 h. Furthermore, the kinase activity was completely abolished in the presence of 100 nM wortmannin, an inhibitor of PI3K. Distinct regulation of PI3K and calcium signaling by CD28 and ICOS stimulation. A, ICOS induces strong PI3K activity. PHA/IL-2 cultured CD4 T cells were stimulated with immunobeads coated with the Abs indicated. Cells were lysed at the times shown and stimulatory beads were used to immunoprecipitate the receptors. Lipid kinase activity was assessed by in vitro kinase assay using PtdIns as a substrate. Reaction products were resolved by TLC and visualized using a PhosphorImager. WM indicates where cells were stimulated for 1 h but 100 nM wortmannin was added to the reaction mixture. Whole cellular lysate (10 μl) was used as a positive control for the assay. Data are from a single experiment representative of three. B, Both CD28 and ICOS induce Ca2+ mobilization in CD4 T lymphocytes. CD4 T cells were loaded with Indo-1 and stimulated by the addition of a cross-linking Ab (arrow). Changes in [Ca2+]i were monitored by flow cytometry. The data are presented as the fluorescence emission ratio of the Ca2+ bound and unbound forms of Indo-1, and plotted as a function of time (seconds). Data are from a single experiment representative of three. Given the link between PI3K activity and calcium mobilization (42), we investigated the ability of CD28 and ICOS to costimulate calcium mobilization. In resting cells, the calcium sensitive subunits of NFAT family proteins are phosphorylated. Upon a Ca2+ flux, the phosphatase calcineurin is activated and, as a result, NFAT is dephosphorylated and permitted to translocate into the nucleus where it influences the expression of many genes, including IL-2 (43). Stimulation of resting CD4 T cells with CD3 Ab alone induced a minor increase in intracellular calcium, which peaked 400 s after cross-linking, consistent with previous reports (44). Costimulation by either CD28 or ICOS resulted in a more rapid and intense calcium spike (Fig. 1⇑B). The effect of both CD28 and ICOS costimulation on calcium mobilization was abrogated in the presence of LY294002 (10 μM), an inhibitor of PI3K, suggesting that both CD28 and ICOS costimulation of calcium mobilization is mediated through PI3K (data not shown). Next we examined the ability of ICOS costimulation to potentiate MAP kinase activation. There are three types of MAP kinases active in T cells: extracellular signal-regulated protein kinase (ERK), p38 MAP kinase, and JNK. ERK activation of AP-1 has been implicated in the up-regulation of the IL-2 gene (45) whereas the role, if any, of p38 remains undefined. Whether JNK activation contributes to IL-2 regulation in human T cells is controversial (23, 27, 46, 47). To examine the ability of ICOS to costimulate MAP kinase activation, CD3/MHC-I-, CD3/ICOS-, and CD3/28-coated beads were used to stimulate the PHA blasts and phosphorylated ERK and p38 MAP kinases were detected by Western blotting. Consistent with the reported lower activation threshold for ERK (14), CD3/MHC-I treatment of cells induced robust activation of ERK, 4- to 5-fold over basal as measured by densitometry. This activation was enhanced by both CD28 and ICOS costimulation (Fig. 2⇓A). CD28 costimulation was a more potent agonist of p38 activity, inducing a 4-fold increase over basal activity, than ICOS stimulation which increased p38 activity 2-fold over basal. No differences in p38 activity were seen between resting cells and CD3 only-stimulated cells, indicating that activation of p38 is more costimulation-dependent than ERK. Regulation of c-jun N-terminal kinase distinguishes CD28 and ICOS signaling. A, PHA/IL-2 cultured CD4 T cells were stimulated with immunobeads coated with the Abs indicated. Cells were lysed at the times shown and activation of MAP kinases was demonstrated by immunoblotting for phosphorylated ERK and p38 MAP kinases (upper panels). Equal loading of proteins was demonstrated by stripping then reprobing the immunoblot for the presence of the whole molecules (lower panels). 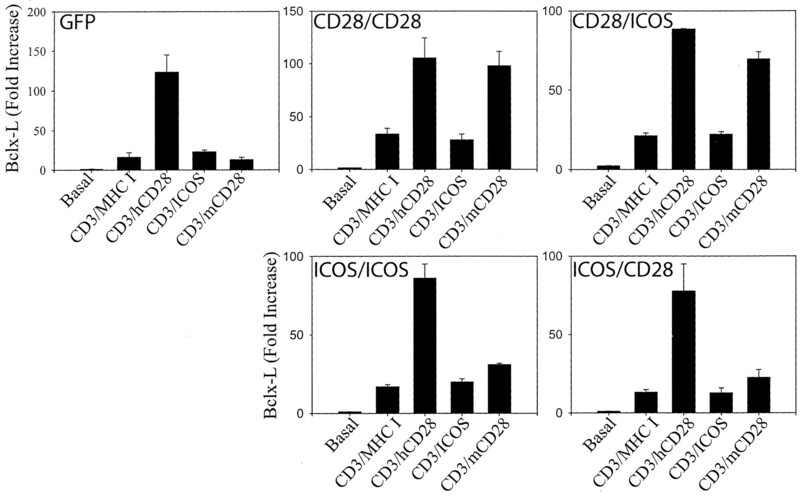 B, PHA/IL-2-cultured CD4 T cells were stimulated with immunobeads coated with Abs indicated. Cells were lysed at the times shown and JNK was immunoprecipitated with GST-c-jun. JNK kinase activity was assessed by immune complex kinase assay. Reaction products were resolved by SDS-PAGE. Phosphorylated c-jun was detected by autoradiography (upper panel) and c-jun protein was detected by staining with Coomassie blue (lower panel). Anisomycin (10 μg/ml) treatment of cells was used as a positive control for the assay. We performed immune complex kinase assays to assess costimulation of JNK by ICOS and CD28. CD3/MHC-I stimulation of the cells failed to induce JNK activation significantly above that found in unstimulated cells (Fig. 2⇑B). In agreement with previous studies, CD28 costimulation induced strong JNK catalytic activity at 1 h, which was still present after 2 h of stimulation (23, 24). However, CD3/ICOS stimulation of cells failed to induce JNK activity above that induced by CD3/MHC-I cell stimulation. Because PI3K has been shown to inhibit JNK activation, it is possible that ICOS signals contributing to JNK activation are masked by the stronger activation of PI3K (24). To investigate this possibility, we performed JNK kinase assays in the presence of LY294002, an inhibitor of PI3K, at concentrations up to 10 μM. Despite increasing JNK activation by CD28 costimulation, this treatment of cells did not improve ICOS costimulation of JNK activation (data not shown). These in vitro kinase data demonstrate that ICOS contributes only weakly, if at all, to JNK activation in T cells. Thus, despite the ability to induce similar gene expression profiles in T cells (except IL-2 and the few other genes which show major differences), ICOS and CD28 costimulation deliver distinct signals to T cells upon ligation. To enable structure/function studies of the ICOS and CD28 cytoplasmic tails in primary human T lymphocytes so we can probe the residues within their cytoplasmic tails that mediate these signaling differences, we created chimeric constructs that contain extracellular domains not found on primary human T cells so that we could distinguish our introduced construct from the native molecules. We initially constructed a chimeric cell surface Ag using the extracellular and transmembrane domains of murine CD8α fused to the cytoplasmic domain of human CD28 (Fig. 3⇓). High titer lentiviral viral vectors (<1 × 108 infectious units/ml) were created and these constructs were transduced into both Jurkat and CD4 T cells. When expressed in Jurkat cells, ligation of this molecule with soluble Ab (10 μg/ml) augmented PMA/ionomycin-induced IL-2 expression, concordant with results from a similar molecule (Ref. 48 ; Fig. 3⇓B). However, when expressed in CD4 T lymphocytes, the mCD8α/hCD28 chimera was unable to costimulate IL-2 production following stimulation of these cells with immobilized Abs (Fig. 3⇓D). Therefore, we constructed a second chimera using the extracellular and transmembrane domains of murine CD28 fused to the intracytoplasmic domain of hCD28. Again, this molecule was able to increase IL-2 production from PMA/ionomycin-stimulated Jurkat cells (Fig. 3⇓F). More importantly, when expressed in CD4 T lymphocytes, the mCD28/hCD28 chimera was able to costimulate IL-2 production following immunobead stimulation, at levels comparable to native CD28 (Fig. 3⇓H). Therefore, subsequent experiments used chimeras expressing the extracellular and transmembrane domains of murine CD28. mCD28/hCD28, but not mCD8/hCD28, chimeras costimulate IL-2 in CD4T cells. 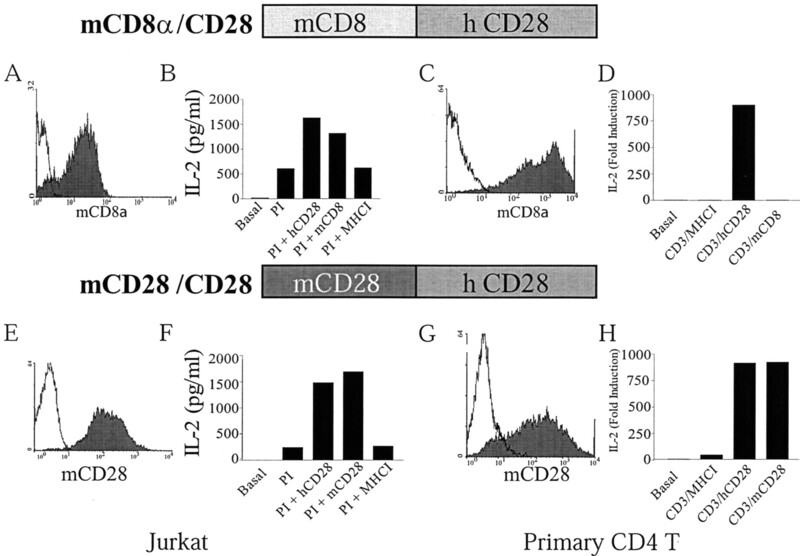 Expression level of the mCD8/hCD28 chimera in Jurkat cells (A) or CD4 T cells (C). B, Jurkat cells were left untreated (basal) or stimulated or treated with PMA at 10 ng/ml and ionomycin at 100 ng/ml PMA and ionomycin (PI) in combination with an Ab (10 μg/ml) against the molecules indicated. After 24 h, IL-2 was measured by ELISA. D, CD4 T cells were left untreated (basal) or were stimulated with immunobeads coated with Abs against the molecules indicated. IL-2 was measured by quantitative PCR, 24 h later. E, The mCD28/hCD28 chimera was expressed in Jurkat cells (E) or CD4 T cells (G). F, Jurkat cells were left untreated (basal) or stimulated or treated with PI in combination with an Ab (10 μg/ml) against the molecule indicated. IL-2 was measured by ELISA after 24 h. H, CD4 T cells were left untreated (basal) or stimulated with immunobeads coated with Abs against the molecules indicated. IL-2 was measured by quantitative PCR, 24 h later. To further examine the regulation of IL-2 by CD28 and ICOS, we constructed CD28/ICOS chimeras with the SH2 binding domains swapped between the molecules (Fig. 4⇓A). Expression of the each chimeric molecule was determined by flow cytometry using an Ab that is specific for murine CD28 and this analysis revealed that we could transduce >95% of primary CD4 T cells using all four constructs (Fig. 4⇓B). Moreover, the mean fluorescence intensity (MFI) of mCD28 expression never varied more than 2-fold for each of the constructs (between 650 and 1300 MFI) in this and all of the subsequent experiments. This level of expression is comparable to the expression of endogenous CD28 (MFI = 1256), permitting us to dissect the contributions of the cytosolic domains to induce IL-2 secretion in primary CD4 T cells using a near physiologic model. Structure and expression of mCD28/hCD28/hICOS-derived chimeras. A, Plasmid expression vectors were constructed to express proteins with the extracellular and transmembrane domain of murine CD28. The intracytoplasmic regions were constructed from the SH2 binding domain (consisting of the region from the transmembrane domain up to and including the YXXM motif) and membrane distal domains of CD28 and ICOS as illustrated. These constructs were introduced into CD4 T lymphocytes using lentiviral transduction. B, The expression profiles of the chimeric constructs 3 days after transduction of CD4 T cells, as detected by flow cytometry are represented in the histogram. MFI values for chimeric receptors varied <2-fold in all subsequent experiments. Our previous demonstration that ICOS elicits much stronger PI3K activity than CD28 was unexpected. However, quantitative interpretation of this experiment may be complicated by the cell surface Ag expression profiles and/or the relative affinities of the Abs used. To generate more definitive data, we performed experiments using CD28/ICOS chimeras, which showed similar expression profiles and use the same stimulatory Ab. CD4 T cells were activated with CD3/hCD28-coated beads and transduced with ICOS/CD28 chimeric constructs. The CD3/hCD28-coated beads were removed 4 days after stimulation and the cells were cultured until they returned to near resting cell size. These cells were restimulated either with CD3/MHC-I- (negative control), CD3/hCD28- (positive control), or CD3/mCD28-coated beads, and PI3K activity was measured by in vitro kinase assay (Fig. 5⇓B). Immunoprecipitates from ICOS/CD28- and ICOS/ICOS-expressing lymphocytes (i.e., chimeras bearing the ICOS SH2 binding domain) showed much stronger PI3K activity than those bearing the CD28 SH2 binding domain. These data generated from the costimulatory chimeric constructs show a strong correlation with the previous data generated from stimulation of the native molecules and suggests that these SH2 binding domain can transduce some signals irrespective of their 3′ tails. Distinct activation of JNK and PI3K by costimulatory chimeras. A, CD4 T cells were transduced with lentivirus encoding GFP or the indicated chimeric construct. Cells were left unstimulated or stimulated with immunobeads coated with Abs indicated, and lysed after 45 min. JNK was immunoprecipitated with GST-c-jun and JNK kinase activity was assessed by immune complex kinase assay. Reaction products were resolved by SDS-PAGE and transferred to nitrocellulose. 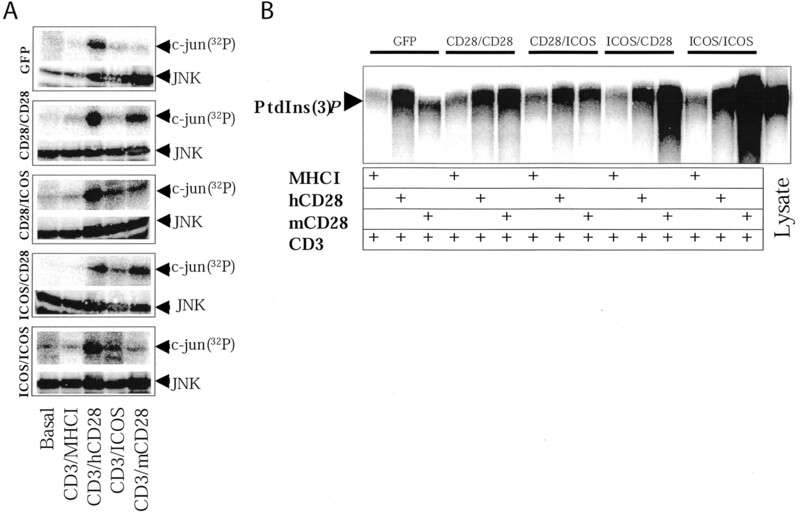 Phosphorylated c-jun was detected by autoradiography (upper panels) and JNK was detected by immunoblotting for JNK (lower panels). 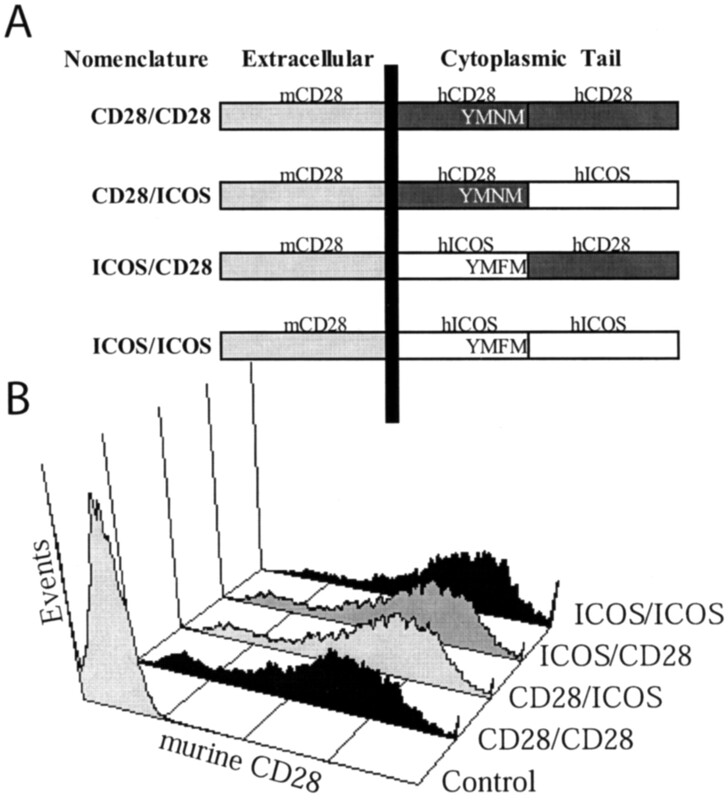 B, CD4 T cells were transduced with CD28/ICOS chimeric receptors. Cells were stimulated with immunobeads coated with the Abs indicated and lysed after 45 min. Stimulatory beads were then used to immunoprecipitate the receptors and lipid kinase activity was assessed by in vitro kinase assay using PtdIns as a substrate. Ten microliters of cellular lysate were used as a positive control for the assay. Lipid products were resolved by TLC and visualized using a PhosphorImager. Truncation mutation of murine CD28 expressed in Jurkat cells has suggested that the ability of CD28 to costimulate JNK catalytic activity maps to residues membrane-distal of the SH2 binding domain (24). To confirm this in primary T cells, and demonstrate that this region is sufficient for JNK activation, we performed in vitro kinase assays with JNK immunoprecipitated from cells stimulated with CD3 in combination with CD28/ICOS chimeras or control cells transduced with green fluorescent protein (GFP; Fig. 5⇑A). In contrast to PI3K activation, it is remarkable that only chimeras bearing the CD28 membrane-distal domain were able to contribute to JNK activation. The ICOS/CD28 chimera provoked an equal amount of JNK catalytic activity compared with the CD28/CD28 chimera suggesting that the SH2 binding domain is unimportant to JNK activation. Stimulation of GFP-expressing cells with CD3/mCD28 beads induced no activation of JNK above that seen by anti-CD3 alone. Having defined the relative ability of the CD28/ICOS chimeras to activate the PI3K and JNK MAP kinase pathways, we next examined the ability of these molecules to promote IL-2 and Bcl-xL production. Because ICOS costimulation did not activate JNK and did not produce high levels of IL-2, we speculated that the ICOS/CD28 chimeric molecule, by being able to superactivate PI3K and activate JNK, would be able to produce IL-2 at a comparable level to CD28 costimulation. To test this hypothesis, CD4 T cells were transduced with the mCD28-based chimeric costimulatory molecules and allowed to rest. Cells were restimulated using immunobeads coated with either CD3/MHC-I, CD3/hCD28, CD3/ICOS, or CD3/mCD28 and RNA was harvested from cells after 24 h. IL-2 mRNA levels were quantified by real time RT-PCR (Fig. 6⇓). CD3/MHC-I stimulation of the cells induced roughly a 20-fold increase in IL-2 mRNA compared with unstimulated cells. CD28-mediated costimulation synergized to produce a 1000-fold increase in IL-2 mRNA, whereas ICOS-mediated costimulation failed to increase IL-2 mRNA above the levels seen with CD3/MHC-I stimulation. Costimulation mediated by the chimeric molecules CD28/CD28 and ICOS/ICOS mirrored that seen with the native molecules, inducing 854- and 10-fold increases in IL-2 mRNA, respectively. The mixed chimeras CD28/ICOS and ICOS/CD28 both failed to reconstitute IL-2 costimulation, indicating that sequences in both the membrane proximal and distal domains are required for CD28-mediated induction of IL-2. CD28/ICOS and ICOS/CD28 chimeras fail to stimulate IL-2 production. CD4 T cells were transduced with lentivirus encoding GFP or a costimulatory chimeric construct as indicated. Cells were left unstimulated or were stimulated with immunobeads coated with the Abs indicated for 24 h. IL-2 expression was quantified by RT-PCR as expressed in comparison to the value obtained from unstimulated cells. The error bars indicate the SD of three replicates and the data are representative of three experiments. CD28-mediated up-regulation of IL-2 and Bcl-xL appear to result from separate signals because Bcl-xL can be up-regulated in the absence of IL-2 (29) and IL-2 can be induced in the absence of Bcl-xL (22, 49). We wanted to see whether our mixed chimeric molecules could shed light into the nature of these differences. Using the same cDNA samples used above to examine the regulation of IL-2 by the ICOS and CD28 mixed chimera cytoplasmic tails, we performed quantitative PCR using primers and probes specific for Bcl-xL (Fig. 7⇓). In contrast to the IL-2 data, the SH2 binding domain of CD28 was necessary and sufficient for the optimal induction of Bcl-xL expression, indicating that all of the signals required to augment the expression of Bcl-xL are contained in the membrane proximal side of the CD28 tail. Together, these results suggest that the entire length of CD28 is requisite to optimal IL-2 induction, whereas only the membrane proximal domain is required for Bcl-xL. Regulation of Bcl-xL expression by chimeric costimulatory molecules. CD4 T cells were transduced with lentivirus encoding GFP or a costimulatory chimeric construct as indicated. Cells were left unstimulated or were stimulated with immunobeads coated with the Abs indicated for 24 h. Bcl-xL expression was quantified by RT-PCR as expressed in comparison to the value obtained from unstimulated cells. The error bars indicate the SD of three replicates and the data are representative of three experiments. The contribution of signal transduction molecules or pathways to the regulation of IL-2 has previously been examined in cell lines, which offer a convenient source of biological material that is amenable to gene transfer experiments. However, during the course of transformation, key signaling pathways may have been altered, confounding the interpretation of experiments performed in these cell lines (50). For example, regulation of the PI3K pathway in Jurkat cells is compromised because these cells fail to express two key enzymes involved in the degradation of PtdIns (3, 4, 5)P3, namely, phosphatase and tensin homolog and SH2 domain-containing inositol 5 phosphatase (51, 52). Furthermore, Jurkat cells produce only minor amounts of IL-2 compared with primary cells (up to a 1000-fold difference), when stimulated with Abs, suggesting that key components of IL-2 control are missing in Jurkat T cells (10). Although primary murine cells provide an excellent model to study T cell activation, an emerging body of evidence suggests differences between murine and human T cells. Isolated murine T cells die within 48 h in vitro unless activated, whereas human T cells can live beyond a week without significant levels of apoptosis, suggesting that murine T cells are more sensitive to apoptosis (53, 54). Furthermore, CD3 stimulation of murine T cells results in significant, albeit not optimal, levels of T cell expansion and IL-2 production whereas highly purified human T cells do not expand at all upon CD3 stimulation and only trace levels of IL-2 are detected, suggesting that human T cells are much more dependent upon costimulatory signals (55, 56). Recent advances in gene transfer technology have enabled high efficiency transgene expression in primary human T cells, making structure/function studies possible (34, 35). In this study, we describe a strategy to model T cell costimulation in human T lymphocytes using lentiviral transduction to express a chimeric form of CD28. This model system allows the study of T cell activation in the cells that will eventually be used in immunotherapy protocols. We first created a chimera by fusing the extracellular and transmembrane domains of CD8α to the intracellular domain of CD28. Ligation of this molecule augmented PMA/ionomycin-stimulated IL-2 expression in Jurkat as reported for similar molecules (48), however this construct completely failed to costimulate CD4 T lymphocytes, suggesting that the identity of the extracellular domain is more important in primary T cells than Jurkat. We have confirmed that the mCD28/hCD28 chimera accurately models native human CD28 in terms of both signal transduction and costimulation of cytokine production, demonstrating the validity of this approach. CD28 has been regarded as the “gold standard” activator of PI3K, however, we found that much greater lipid kinase activity was associated with CD3/ICOS immunoprecipitates than CD3/CD28. This observation was found in both untransduced CD4 T cells and CD4 T cells that expressed the CD28/ICOS-derived chimeras, and correlates with recent findings in murine cells (57). Activation of the PI3K downstream effector Akt/protein kinase B has been proposed as sufficient to costimulate IL-2 expression (15). The exaggerated activation of PI3K after ICOS costimulation (which correlates to more pronounced Akt activation in the murine system; Ref. 57) argues that more factors are required for optimal IL-2 production in primary T cells than Akt. Moreover, this enhanced activation of PI3K by ICOS suggests that ICOS signaling may be more dependent upon PI3K than CD28. CD28 induces both strong activation of JNK and strong increases in IL-2 production. This correlation has prompted several investigators to examine the role of JNK in IL-2 expression, however, this issue has yet to be fully resolved. Potentially, JNK contributes to IL-2 regulation via the phosphorylation of c-jun, one-half of the transcription factor AP-1. Also, JNK may regulate IL-2 mRNA stability through promotion of the proteins nucleolin and YB-1 (47). Indeed, mouse cells, which do not express upstream activators of JNK, have shown decreased IL-2 production (49). However, studies in mice failing to express JNK isoforms have yielded contradictory results with different groups reporting either an increase (27) or decrease in IL-2 production from T cells (46). It was tempting to speculate that the inability of ICOS to activate the JNK pathway explained its inability to costimulate IL-2 production. We showed that swapping the CD28 membrane distal region conferred JNK activation to ICOS, however this was insufficient to allow maximal IL-2 production. Our experiments demonstrate that JNK may be necessary, but not sufficient, for optimal IL-2 production. Lastly, one of the roles of JNK is to remove NFATc1 from the nucleus, and thus the elevated levels of TH2-type cytokines observed in ICOS-costimulated T cells (31, 58, 59) may be the result of the inability of ICOS to activate JNK. The mCD28/human chimera approach described in this study proved an accurate model for costimulation because the CD28/CD28 and the ICOS/ICOS chimeras each mirrored their native counterparts, both in signal transduction and IL-2 regulation. The inability of the CD28/ICOS-mixed chimera to match CD28 in promoting IL-2 expression may have been predicted because this molecule lacks the two SH3 binding domains and three tyrosine residues that occur in the CD28 tail, membrane proximal of the SH2 binding domain, which may be important to IL-2 regulation (20, 24, 60). However, the inability of the ICOS/CD28 chimera to costimulate maximal IL-2 production was unexpected, given that the ICOS SH2 binding domain is capable of activating PI3K (8, 57) and the CD28 tail induced JNK activation. This suggests that a discrete signal is generated by CD28, but not ICOS, from the region between the SH2 binding and transmembrane domain that is required for proper regulation of IL-2. Further evidence that there is at least one additional signal in the CD28 membrane proximal tail than in the analogous ICOS tail was observed examining Bcl-xL expression. In this study, the CD28 membrane proximal region was able to induce optimal levels of Bcl-xL whereas the corresponding ICOS domain could not. Moreover, these results support the data demonstrating differential regulation of IL-2 and Bcl-xL by CD28 (22, 30) and help clarify some of the differences. Our data revealed that a signal other than PI3K is produced in the membrane proximal region that is required for both optimal IL-2 and Bcl-xL expression. Whereas this additional signal is sufficient for Bcl-xL expression, maximal IL-2 production required an additional signal located in the membrane distal region of its cytoplasmic tail. Numerous possibilities exist for generation of this membrane proximal CD28-specific signal. First, three serine residues exist in this region. Ligation of CD28 is followed by heavy phosphorylation on serine/threonine residues (61) and, although functional significance has yet to be attributed to this phenomenon, potentially this serine phosphorylation could lead to activation of CD28-regulated serine/threonine signaling pathways or stabilize protein associations with CD28. Second, CD28 binds the adapter molecule Grb2 and its family member Grb2-related adaptor downstream of Shc (12, 13), which may enhance activation of signaling networks allowing high level expression of IL-2 (14), or activate a discrete signaling pathway. Additionally, it cannot be discounted that the exaggerated activation of PI3K demonstrated for this chimera may serve to oppose IL-2 expression (62). Finally, it must be considered that these theories are not mutually exclusive, thus each may contribute to the regulation of IL-2. The nature of the CD28 SH2 binding domain signal is the subject of ongoing research in our laboratory. The observation that neither the CD28/ICOS nor the ICOS/CD28 chimera was able to costimulate maximal IL-2 expression demonstrates that the ability of CD28 to costimulate IL-2 depends upon coordinated signals generated from the entire cytoplasmic domain of CD28, and cannot be ascribed to a discrete motif or pathway. This strict regulation of IL-2 reflects the importance of the molecule to proper immune function, and highlights the exclusive relationship between this cytokine and CD28 costimulation. Following submission of this manuscript, similar results were published by Harada et al. (63). These experiments showed that a point mutation in the ICOS SH2 binding domain enabled the molecule Grb2 to bind and this correlated with increased ICOS-driven IL-2 promoter activity in Jurkat T cells. We thank Drs. Richard Carroll, Bruce Levine, Robert Vonderheide, David Allman, Gary Koretzky, and Craig Thompson for insightful discussions; William DeMuth for flow sorting, Katsunari Tezuka (Japan Tobacco) for providing the anti-ICOS (AILIM) Ab; Tom Dull and Kristen Hege (Cell Genesys) for providing the lentiviral vectors; and Coral Haas for administrative support. ↵1 This work was supported in part by Grant 6240 and by a Specialized Center of Research from the Leukemia and Lymphoma Society and by the Neil Ruzic Research Foundation. ↵3 Abbreviations used in this paper: ICOS, inducible costimulatory protein; SH, Src homology; PI3K, phosphatidylinositol 3-kinase; MAP, mitogen-activated protein; JNK, c-jun N-terminal kinase; h, human; m, murine; MHC-I, MHC class I; ERK, extracellular signal-regulated protein kinase; MFI, mean fluorescence intensity; GFP, green fluorescent protein.